Re: The New Chess Thread! Out that grouping, I think Mormon chess is my favorite. Man, try to imagine a game of chess played with all queens. I think it would end in a rather fast if not apocalyptic fashion. Chess programs will generally let you set up the board as you like. Some will even let you set up the board in an impossible fashion, like 15 queens per side. I've played it. I lost rather quickly to the computer. Friends, I give you chess 2.0. I wouldn't mind if every player had access to secret tactics like these. Delightful. There are actually dozens (hundreds? thousands?) of chess variants. One is sniper chess (or something like that), where, when a capturing move is made, the capturing piece does not actually move, but the opponent's piece is removed from the board. 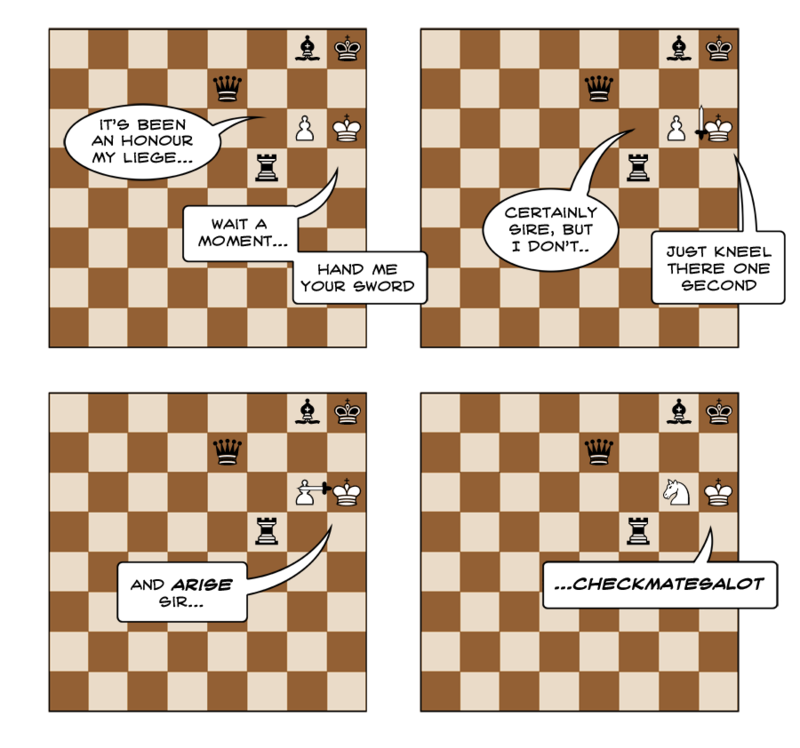 In assassin chess, a player is allowed to capture his own pieces as if they were enemy pieces. 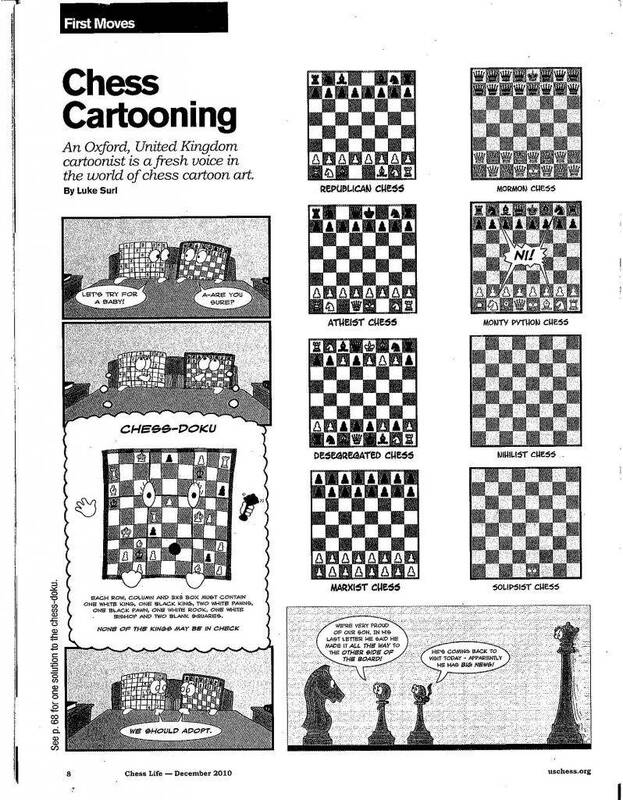 That cartoon reminds me of some chess puzzles. One such puzzle involved a similar setup (White was going to lose in a move), but had a pawn that could promote that move. The notation said that the pawn could promote to any piece. Right, we all know that. BUT, the solution was to promote the pawn to a black knight, winning the game with checkmate. Beautiful. One such puzzle involved a similar setup (White was going to lose in a move), but had a pawn that could promote that move. The notation said that the pawn could promote to any piece. Right, we all know that. BUT, the solution was to promote the pawn to a black knight, winning the game with checkmate. Beautiful. That's very, very clever. It's so clever in fact, I would probably miss the idea and go for the queen promotion like everyone does. Of course, that was the point of the puzzle. To make you think outside of the box (or grid, as the case may be). Yes, maybe a few days ago. I think that right-handed only rule should also be applied to Indigo Montoya when he indulges in a game of chess. This is hardly surprising. Gasoline is like candy and cheap wine to spiders. I know of a group of spiders that have set up a bar right inside the gas tank of my car. The place is called "ArachNed's," because Ned is the spider that owns the joint. Guess who's coming home for dinner? Hmmm. Does this cartoon suggest that perhaps promoted pawns love to dress up as drag queens? Bad pun. Bad, bad, bad pun. Bad. Alpha Centauri wrote: ... dress up as drag queens? Ha! Why hasn't anyone else thought of that before? Oh, I'm sure someone has. There you go. This is from a blog posting way back in 2011. A few comments at the bottom make the same joke about pawns dressing up as drag queens. So there you go. No one is truly original. Alpha Centauri wrote: So there you go. No one is truly original. Even that idea. "Nothing new under the sun." Written thousands of years ago. Very true, Linus. There could be no greater praise lauded on the individual than a certificate of distinction from a local chess club. I can think of nothing in life that can even compare to it. Lol that's kinda cute. I can see a real kid doing that. 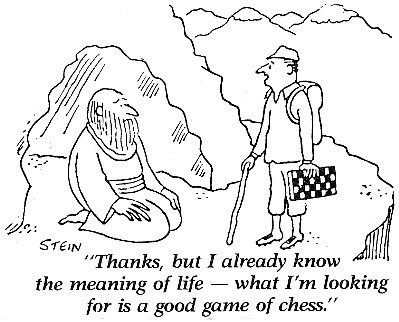 So, taking a break from chess? I notice that you're not playing anyone right now, and you haven't responded to my challenge. Bummed that you lost to Marc? My game hasn't been that great either, the last many games or so. No, I have been up to a few other things over the last few days. And with a ramped up work schedule, I haven't had much time to really think about chess. As for the game with Marc, I think he played a good game. I did have a pretty good combination going that sort of blew up in my face at the critical moment. After that, the play went downhill for me. That white king has good a reason to be panicked. Once you play black you never go back. 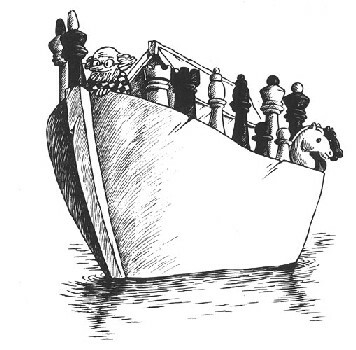 What if Noah were a chess nerd? The question now becomes whether the Earth could be successfully repopulated with nothing more than chess men and one crazy chess aficionado. Stranger things have happened I'm sure. Robert James Fischer wrote: All I want to do, ever, is play chess.